Perched high on a hillside with panoramic ocean views over Luz and Lagos bays, at Quinta Bonita traditional charm and modern luxury blend seamlessly in idyllic surroundings to create a truly unforgettable experience. A choice of 8 spacious double or twin rooms and a 2 bedroom garden cottage, all individually designed and beautifully decorated with designer fabrics, in which to unwind. Every room boasts its own private terrace or balcony and is fully equipped with 100% Egyptian cotton linen, mini-bar, air-conditioning, flat screen satellite TV, bathrobes and luxury toiletries. Full buffet breakfast/brunch featuring fruit from their orchard and warm bread delivered daily at dawn is enjoyed whilst overlooking the sweeping lawns. 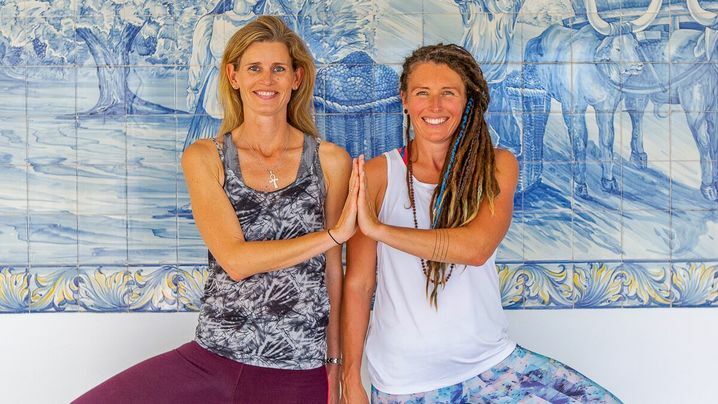 Daily Yoga in the fully equipped Azulejos (Portuguese tiled) glass fronted yoga studio with stunning outlook over the spectacular gardens and cork insulted wooden floor. 10,000 square metres of spectacular gardens, including a large outdoor swimming pool, cobbled pathways, ponds and fountains, help yourself to a drink from the honesty bar as you enjoy lunch by the pool, indulge in a massage or for the more energetic take a spin on one of their hire bikes. 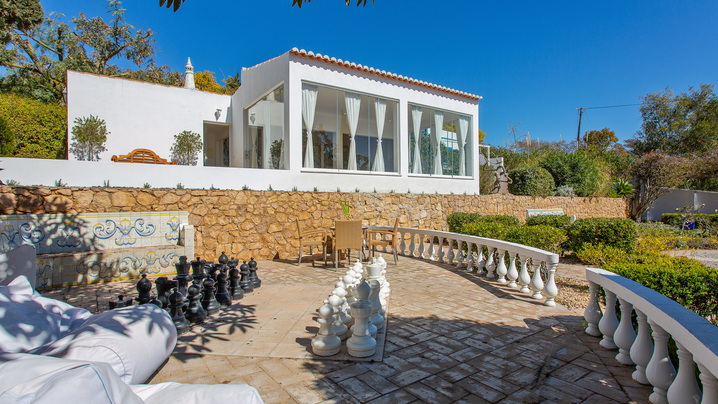 Fantastically located - the ancient port of Lagos with its castle walls, narrow, cobbled streets and pottery shops and many of the beautiful Algarve beaches are just a few minutes’ drive away. 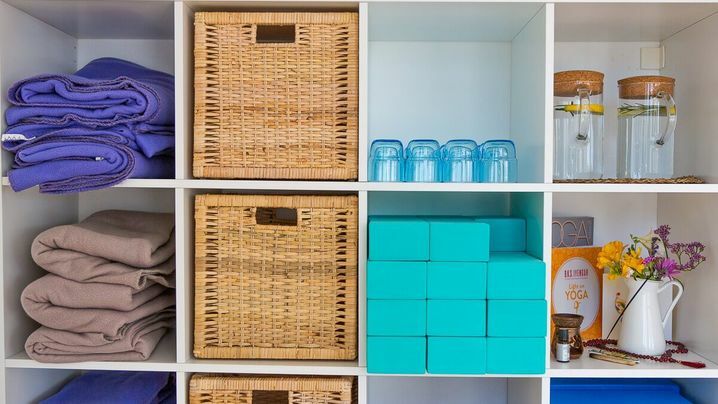 90 minute morning yoga class daily and an afternoon or evening stretch and restore class. Round-trip transportation to and from Faro Airport (FAO) is included on the first and last day of the trip. It takes 1 hour to get to the venue from the airport. Not included: flights to/from Faro Airport (FAO) and travel insurance. Guests are responsible for purchasing travel medical insurance and cancellation insurance which are also not included. 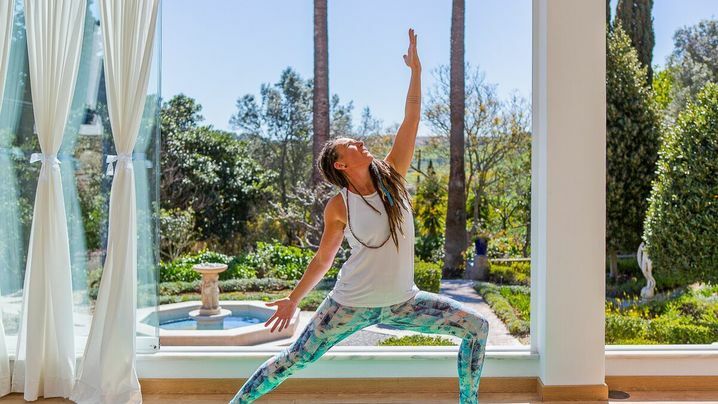 Susan Parsley Is the Owner of Lenox Yoga and the Wellness Director at CMC Berkshires, an Exclusive Property nestled in New Marlborough Mass. Here, she personally evaluates each client and prescribes a full wellness and fitness regime as they journey back to health. Sue is also a certified master yoga instructor specializing in Arm Balances and Inversions. 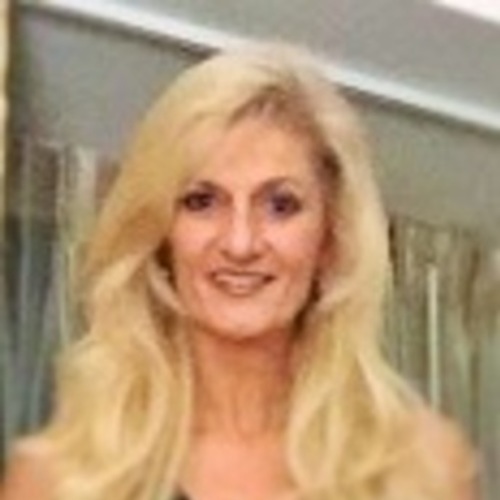 Sue teaches and has taight at many WORLD CLASS facilities including Canyon Ranch Lenox and the Wheatleigh Hotel in the Berkshires, Club Westmoor in Nantucket, and as a representative for Fitbodies International. As a former athlete and coach, Sue quickly found her way to the forefront of yoga teachers. The precise instruction and athletic edge she adds to the fitness aspect of her classes make them palatable to both the seasoned practitioner and the weekend athlete. Sue works directly with many celebrities and high profile clients sculpting their bodies naturally and her approach has landed her respective Awards for Outstanding Guest Service at Canyon Ranch for 10 years in a row. The past two years Sue was named Ambassador to The Canyon Ranch Institute, an honor reserved for those who embody the highest standards of wellness, both personally and professionally. In addition, she was chosen as a Canyon Ranch "Culture Keeper". As a culture keeper, Sue was interviewed and taped to preserve her methods for new employees at canyon ranch to follow. Sue continues to teach weekly in her studio and likes to kick her classes up a notch with fun music and class camaraderie and challenges her students to continually grow in their practice..
Full buffet breakfast/brunch featuring fruit from their orchard and warm bread delivered daily at dawn is enjoyed whilst overlooking the sweeping lawns. Yoga retreat programs are fully catered for and include afternoon tea with cake and fruit and dinner. Option to dine at a local winery also possible. 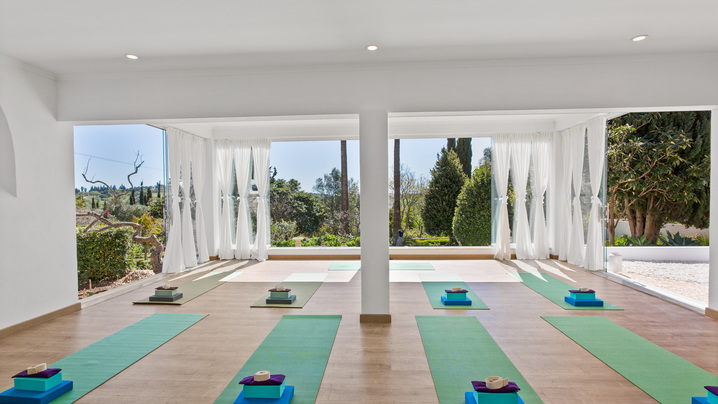 Fully equipped Azulejos (Portuguese tiled) glass fronted yoga studio with stunning outlook over the spectacular gardens and cork insulted wooden floor. Mats, bricks, blocks, eye pillows, straps and bolsters included. Explore the 10,000 square metres of spectacular gardens, including a large outdoor swimming pool, cobbled pathways, ponds and fountains, help yourself to a drink from the honesty bar as you enjoy lunch by the pool, indulge in a massage or for the more energetic take a spin on one of their hire bikes. Note: Some date requests at this property require additional minimum guest commitments from trip leaders. Reserve your spot with a $295 deposit! The cottage is 64m² and has a fully equipped kitchen, living/dining area and sliding doors that open out onto a large shaded terrace with BBQ dining area. It has a main double bedroom with ensuite bathroom and a second single bedroom if travelling with a third person. There is a sofa bed in the lounge. 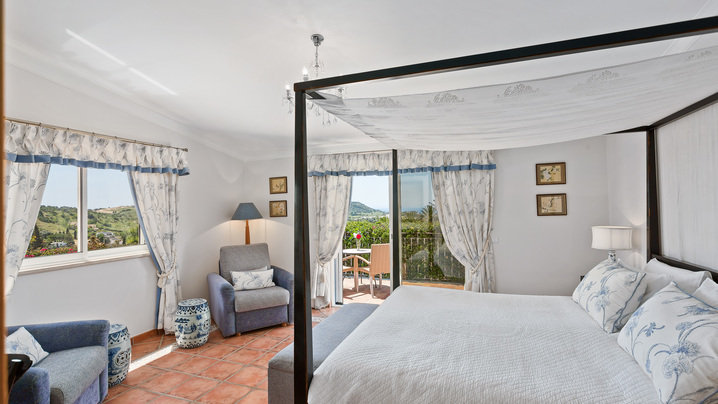 Being located close to the road at the bottom of our grounds, Casa Bonita has views of the countryside rather than the elevated sea views of the main house. Beds can be king size or two twin beds. All rooms are ensuite. Great week! A really lovely group Perfect hosts at Quinta Bonita, we will be back! Join Susan's Tribe and stay up to date on their trip!